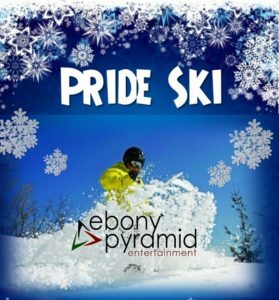 Events listed are produced by Ebony Pyramid or Official Promotional Partners of EPE. 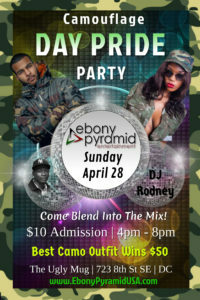 Wear your best CAMO outfit and dance the day away with the sounds of The Legendary DJ Rodney. Food and drink specials. With best camo outfit competition. 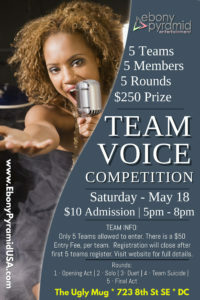 Join Ebony Pyramid Entertainment’s Team Voice Competition. Watch five teams with five members each compete in five rounds of musical acts for a chance at a $250 cash prize. BACK BY POPULAR DEMAND!!!!!! YOU SHOWED UP, SHOWED OUT AND SOLD OUT FOR THOSE WHO WERE THERE LAST YEAR….. THEN YOU WOULD KNOW. WE ARE BACK FOR ANOTHER OFFICIAL CLUBHOUSE REUNION. You are cordially invited to experience the Official CLUBHOUSE Reunion. This is a lifetime event, not to be missed. Yes it is happening in the form of a Day Party to remember on Sunday, May 26, 2019 from 3PM – 9PM at Bravo Bravo 1001 Connecticut Ave. NW., Washington, DC. Earlybird tickets are on sale now at www.eventbrite.com. (PLEASE NOTE THAT TICKETS CAN ONLY BE PURCHASED ON EVENTBRITE. NO TICKETS WILL BE SOLD AT THE DOOR SO DON’T MISS OUT!!!! See you on the dance-floor. ALSO CHECK OUT AND JOIN THE OFFICIAL CLUBHOUSE REUNION PAGE ON FACEBOOK, tell us about your Clubhouse memories. 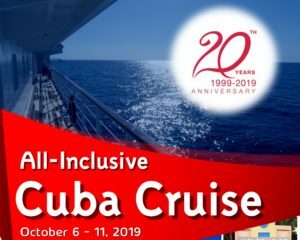 Join Ebony Pyramid Entertainment’s 20th Anniversary Celebration with its All-Inclusive Cuba Cruise. The event will begin with a Miami Pre-Cruise reception on October 6, 2019. The cruise will depart on Monday, October 7 and return on Friday, October 11. Cruise stops will include Key West, Florida where there will be an EPE Party and Production. The final stop will be in Havana, Cuba with an overnight stay and EPE excursion. Upon return to Miami on October 11, EPE will host a gathering. October 11 – 13 in Miami will also be Miami Caribbean Carnival. 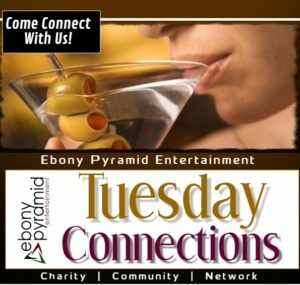 For more information, visit www.EbonyPyramidUSA.com to book your Pre-Cruise Host Hotel and to purchase your EPE Pre-Cruise and/or Anniversary Pass. 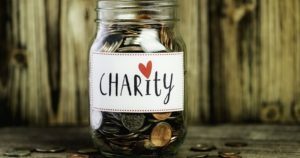 To be a part of the EPE group, guests must book their cruise with the EPE Group representative at Norwegian Cruise Line by calling Jessica Kranis at (954) 514-4271 and reference EPE Group ID 878301. If you cannot reach Jessica, call (855) 625-4768 and reference the Group ID.